Generally thicker bags are better. For Mylar, you can go from 1 mm to 2 mm. Poly bags are thinner and generally available as 1.2 mm to 1.5 mm. If you do find poly bags that are thicker, the cost difference generally should push you to use Mylar. POLYPROPYLENE: A plastic often used in comic storage. Has been judged to be harmful when used for long-term storage. If you use poly bags, it is recommended that you replace them often. POLYETHYLENE: A polymerized ethylene resin that is inert, translucent and creates a lower static charge than polypropylene. The translucent nature of polyethylene prohibits a greater amount of light penetration than the transparent polypropylene. The lower static charge produced by polyethylene as opposed to the higher charge emitted by polypropylene means that polyethylene will attract much less dirt, dust, and other foreign, organic elements. Polyethylene is more flexible than polypropylene. MYLAR: A biaxially extruded polyester film that is simultaneously stretched in two directions to give it maximum strength. Resistance to diffusion of gases like oxygen, carbon dioxide, sulfur dioxide, etc. is 350 times greater than polyethylene. Resistance to moisture, insect attack, fungus, mold, mildew, acid, oils, grease, and solvents is excellent. Mylar is the Cadillac of storage bags. 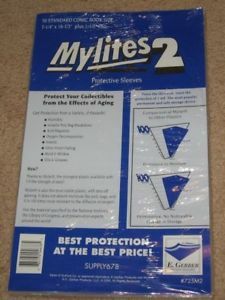 One of the brands of Mylars is the Mylites (the number after the name indicates the thickness in mm). 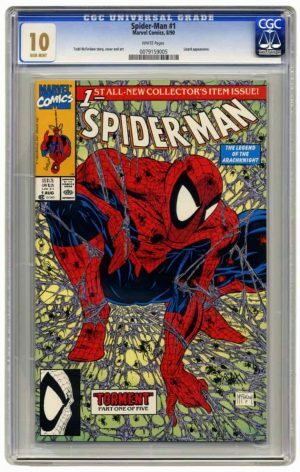 In addition, if you are looking to sell your comics, they tend to look much more vivid and true to the book condition in Mylar. Poly bags get ripples in them over time that reflect poorly on the book. While not a bag per se, these still count as storage. 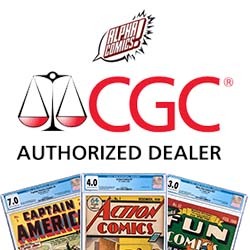 Companies like CGC don’t just grade comics, they also have processes for dry cleaning and pressing. These processes, when combined with putting the comic in a slab, are a great way to protect your book. Remember, you don’t always want to grade your book (and may not be worth it for lower grade books), but your admiration for that book can be worth a lot more. The only downside to graded slabs is that you cannot access them to read anymore. However, in this day of digital copies, that’s become less of an issue. Current (7″) – Designed for a tight fit on current comics. A thicker annual, giant size or indie comic might not fit. Standard/Bronze (7-¼”) – A good overall width for comics from the 1970s onward. In fact, most Marvel Comics from the 1960s that are normal thickness (e.g., not giant-size annuals) fit just fine in these bags. Silver/Gold (7 ¾” to 7 ⅝″) – Good for the 1950s onward. These present a challenge on storage because they are too wide to fit in a normal long box or drawer box unless stored sideways. Magazine – Designed for Heavy Metal and other magazines that are traditionally much bigger than comic books. Remember that backing boards also come in the same overall sizes as the bag sizes above. be sure to buy the appropriate one for your collection. Backing boards help in a few ways: protect the edges from damage, protect against bending, and provide impact protection on the back side. BASIC: Typically .24 mil thick these are usually shiny on one side and a matte finish on the other. The shiny side is coated with a very thin 3% calcium carbonate buffer and should be the side that is placed next to the comic book. ACID-FREE The “Mylar” of boards. These are pH neutral cellulose fiber and are buffered throughout with 3% calcium carbonate. There is no “shiny side”, either side can be placed next to the comic. 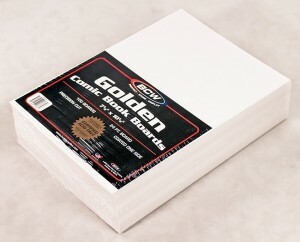 These typically cost 2.5x and up what standard backing boards cost. They come in 24 mm and 42 mm thickness (depending on the stiffness you want). Thicker boards take up some extra room in the bag and may make the fit for your comic very snug so it does not go in and out of the bag easily. Also called half-backs or full-backs. Boxes are used to keep your collection out of the sun, moisture, dust, etc that affect the overall appearance of your books. Each style of box affords a specific level of protection (and/or aesthetic value). 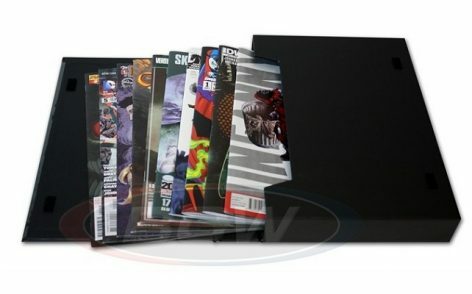 Short boxes: Hold 150-200 comics (depending on bag/board thickness and thickness of the comics). These are ~15″ long and weigh about 30 pounds when full and most collectors find them fairly easy to move around. There are several short boxes produced with designs on the outside – be aware that these don’t always conform to standards for sizing. Long boxes: Hold 250-300 comics (depending on bag/board thickness and thickness of the comics). These are ~27″ long and weigh in excess of 50 pounds when full. Many collectors find these fairly cumbersome to move around. Magazine boxes: Similar to short boxes, but 9″ wide and slightly taller so they can accommodate wider magazines and wider format graphic albums. 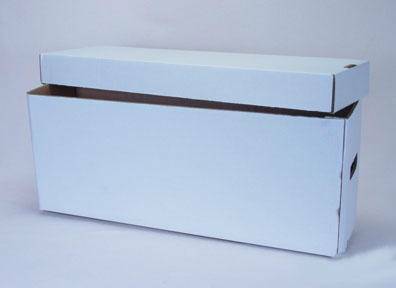 Graded Comic Storage Boxes: These are larger sized and made to accommodate books in graded slabs. Plastic: A very sturdy box that provides an extra level of protection from moisture. A lot of the higher end boxes are sealed at the bottom. This has the benefit of if you have flooding unless the water flows over the top, you are protected. Cardboard boxes will not survive a flood of any sort. While you can do everything in your power to protect the individual books from the elements if you place the comic in a spot that could flood you are asking for a sad ending. Comics are particularly happy to take on water, and as a result, when sitting for a while – they mold up. In addition, the comic paper becomes brittle and will break when handled. 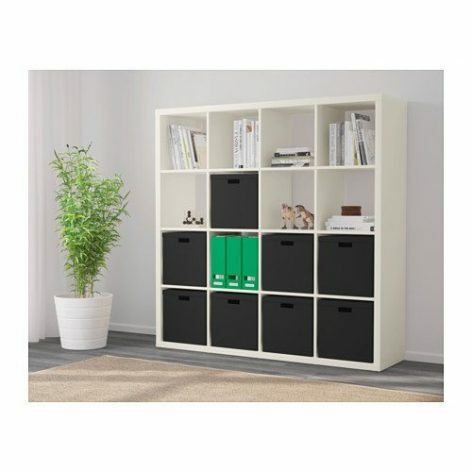 For those on a budget, I would suggest using the Ikea Kallax shelves. There’s a reason you see these shelves at a lot of comic book stores: they are the perfect depth for short boxes. They also allow space on the sides to temporarily store comics before being filed. In addition, they raise the boxes off the ground by a couple of inches in case water does get into the room you have your comics stored. You even have the choice not to use the bottom shelves for even more protection. The storage location is super important: anywhere that is moist such as the attic, basement or garage are not good places to store your prized possessions. In the home environment, you can’t always control the humidity 100%, so throw in a silica bag or two into your boxes. If they put these into $1000 computer component bags, then you will be in good hands for your books. Not everyone puts their books in a box never to be touched again. Since comics are much like other collectibles, people love to trade, sell and buy them over and over again. As a result, you need a way to carry them so they don’t get crushed (or more importantly, damaged in a way the reduces its value). TOP LOADER: These are rigid plastic sleeves that you slide a bagged/boarded comic into for additional protection. These are made of PVC and are not archival (like Mylar). Mostly use for transitional purposes, like carrying to a show or shipping. STOR-FOLIO: These are plastic boxes that act as a mini storage box. They are small enough to carry and extremely durable for those long treks through the comic con. These tips for storing your books aren’t just for your end result. Collectors want these books to be stored so the next generation can enjoy them for a very long time. We love our stories!